Standing alone, the hydrogen atom contains one positive proton at its core with one negative electron revolving around it in a three-dimensional shell. 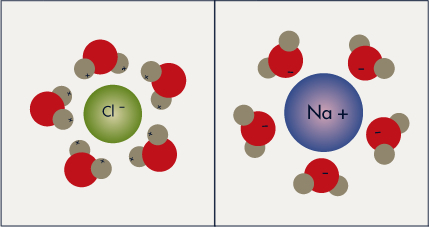 Oxygen, on the other hand, contains 8 protons in its nucleus with 8 electrons revolving around it. This is often shown in chemical notation as the letter O surrounded by eight dots representing 4 sets of paired electrons. To illustrate water's ability to break down other substances, consider the simple example of putting a small amount of table salt in a glass of tap water. 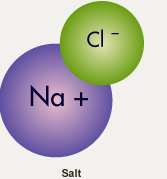 With dry salt (NaCl) the attraction between the electropositive sodium (Na+) and electronegative chlorine (Cl-) atoms of salt is very strong until it is placed in water.